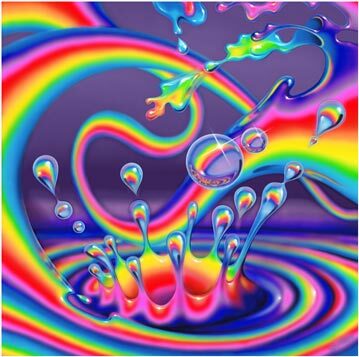 If you could imagine some spontaneous trick of Nature that might reveal itself playfully in lively, dancing and splashing color, much like a delighted child might indulge in, you might envision this seemingly alive and energetic display of a crazy rainbow. It might splash in pools of its own colorful substance, mingling with the elements of water, air and wind, thrashing and twitching wildly like some fantasy snake of hues, leaping and skipping across space, almost tangling within its own chaotic loops. The surprise, joy and almost laughing display of frenzied, excited, emotionally charged delight that no ordinary sight could deliver, just might live in the mind of the happiest of souls. Perhaps this is what the eyes of the truly glad heart see in every rainbow and after every storm. Let the beats and rhythms of profound gladness jump and soar in the minds of those who would look for this in even the most mundane episodes of daily life.